Ten lovely, eager playwrights down. Three recalcitrant ones to go. That’s right, we’re continuing our series of unproduced plays by the playwrights of 13P (who are soon to host their benefit, don’t forget!). 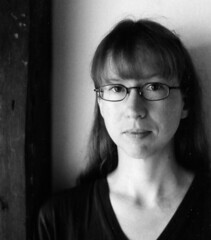 This week we feature a personal favorite, playwright Anne Washburn. Her plays include APPARITION, THE LADIES and THE INTERNATIONALIST. THE INTERNATIONALIST was originally mounted by 13P in NYC, has been produced or workshopped in Berlin, Budapest, and Sydney, and will go up at the Vineyard Theater in the Fall of 2006. Support includes NYU’s Goldberg Award, a MacDowell residency, and a Cherry Lane mentorship with Craig Lucas. Anne is an Associated Artist with The Civilians and New Georges and a member of New Dramatists. MFA: NYU. I don’t understand how I arrived at this point. Up to a certain point everything is clear; for example I remember I’m 15 and I’m in the library looking at a girl who is in my math class at school. I allow myself to look at her breast so long as I calculate the internal angles and adjacent arcs. I am terrible at geometry, terrible, because I sit behind her in class and I can always smell her sweat, faintly but distinctly — it is literal to say that she is a bit of a dirty girl, just a little pungent, why doesn’t her mother give her a cake of white soap to use, I think to myself, hasn’t anyone taught her to lather up in the bath and to rub the white cake of soap all over her body? And then there is no thinking of math. But in the library I think to myself just imagine what I have discovered: I can look directly at her breast, I can even picture it uncovered by her sweater, uncovered by her bra, and so long as I am straining my mind with that equation that you derive from the hypotenuse, I am in no danger whatsoever. Math has given me a tremendous power, I think to myself; so long as I am not particularly good at it there is no end to my self control, even a naked woman, say that late at night a naked woman appeared next to me in my bed; there are so many arcs and angles in a naked woman that I could calculate for hours. But then in my head I see the naked woman. I rush to start calculating her but she is an imaginary naked woman so she is not very precise, and her arcs sort of shift about, and her angles, and my geometry only slips off of her nakedness, and even though my geometry is gone she is still very naked and then I feel a very hot sensation on my face and I realize that although I have been inside of my own head my eyes are still on the girl’s breasts and she has looked up and seen me staring at them and her eyes burn angry holes into my cheeks and I blush so tremendously that I know I must be as red as a beet but unfortunately I cannot at present stand up so I must nod to her stiffly and bend down to my math. I think that she will now hit me with her book but instead she walks out of the library. I look at the equations in front of me with the miserable knowledge that they will never be of any use. After that, I think it is all just a blur. What led me here, I cannot recall.